Baan Home Baan Home means home in Thai. It’s a fitting name since this shop features reasonably priced antiques from all over Asia. Look for chests and vases, as well as plenty of other fine furniture selections. Baan also sells candles and spa goods, such as bath salts and all-natural soaps. 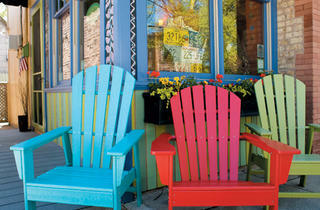 When it comes to patio furniture, the shop includes items such as teak lounge chairs ($448) and coffee tables ($198). 5053 N Clark St (773-905-1228, baan-home.com). Wed, Thu, Sun noon–7pm; Sat 11am–7pm. Big Lots Yes, this discount chain features a mishmash of goods. You can find anything from bedding to kitchen gadgets and even, you guessed it, patio furniture. The furniture is sold in sets, so you can get a four-piece steel and mesh folding set (which includes two chairs, a love seat and a small table) for just $107. Five-piece sets with a bigger dining table are around $250. 4628 W Diversey Ave (773-283-3241, biglots.com) Mon–Sat 9am–9pm; Sun 10am–7pm. Cost Plus World Market From kitchen gear to obscure candies and affordable wines to floor rugs, this global-inspired chain pretty much has a little something for everyone. And although it usually sells out by the time BBQ season is full swing, the store still has a decent selection of patio furniture—much of it is currently on sale. Locations around the city, worldmarket.com. Gethsemane Garden Center This Andersonville plant mecca is known for its warm, quiet nursery, where you can commune with nature by strolling among the vibrant cyclamens, orchids and begonias, and the fountain filled with colorful koi. The store also offers a variety of outdoor furniture made of weather-resistant materials, such as cast aluminum, wrought iron, resin wicker, teak, hardwoods and tubular steel. Plus, you can even custom-design your own cushions and pillows here. 5739 N Clark St (773-878-5915, gethsemanegardens.com). Mon–Fri 9am–8pm; Sat ,Sun 9am–6pm. DEAL Green Sky Home Want to go the ecofriendly route this summer? This übergreen Andersonville shop has you covered. Everything in the store is fair trade and made from recycled or repurposed items by local artists or nonprofits. 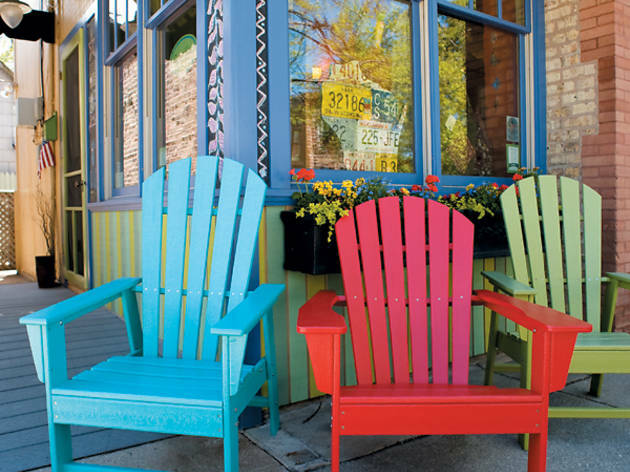 Throughout May, TOC readers get 15% off the shop’s outdoor furniture, which is made in Indiana from reclaimed milk jugs and includes chairs, rockers and tables available in 12 colors. 5357 N Ashland Ave (773-275-1911, greenskycompany.com). Thu–Sat 11am–7pm; Sun noon–5pm.